Our superior artificial grass installation process is engineered to provide your San Francisco Bay Area home with a stable, beautiful, lush lawn which looks and feels real... We guarantee it! When it came to developing an installation method for onelawn® synthetic grass, we conducted extensive research to ensure our method is the best. To be the leaders in the industry, we use high-quality materials and techniques – different from those of other turf companies. All of our products are installed by trained Installation Specialists. We use all employee-only crews who have been subjected to complete background checks and are bonded and insured. The integration of artificial grass into a home landscape requires some initial analysis. What areas will be used by children? Will pets have access to the entire yard? Are there grass species common to the region that need to be matched? Will kids be playing sports on it or is it primarily for aesthetics? At onelawn®, we ask the questions that will help us determine the best products for your particular needs and then work with you to design the ideal solution for your space. With this information, we can develop a plan, create installation drawings and work on securing all necessary permits. We then utilize a step by step process whereby we prep the site, develop the base and drainage system and then install the turf utilizing our innovative SurStay™ Engineering Installation System. 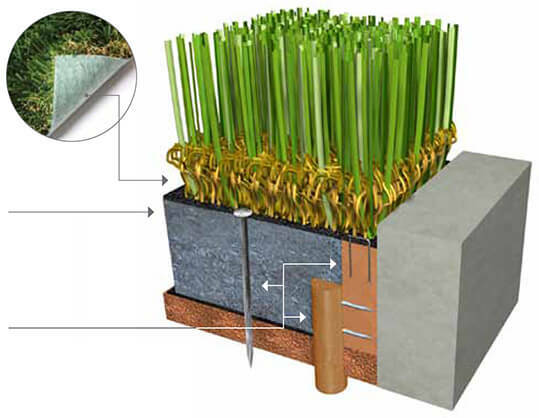 Our SurStay™ system has revolutionized the artificial turf installation process. This specialized method, developed after extensive research and field testing, delivers a safe and secure perimeter while stabilizing the body. Your onelawn® installation will be performed by factory-trained, tenured craftsman who will deliver a hassle-free experience and peace of mind. Our Duraflo® backing material is made from 100% polyolefin material and is up to 50% more permeable than perforated urethane backed products. Synthetic grass with Duraflo® is 100% recyclable. The foundation of onelawn® is composed of superior crushed granite substrate which always maintains its structural integrity and offers excellent drainage and compaction. onelawn® synthetic lawns are secured to our edge system using no-rust, galvanized steel perimeter fasteners, providing a perfectly secure edge around your entire lawn.